Dress up and pretend play is part of a preschooler’s life! 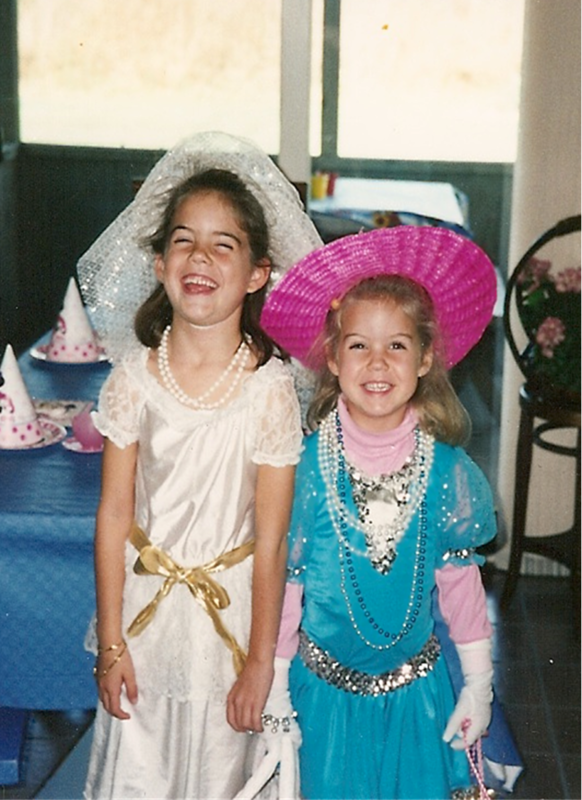 Kelsey and Kaitlyn getting ready for a “fancy” tea party we had with friends! One of my favorite stages is preschool age, age 3 to 5. Those years in our house were full of imagination, dolls, trains, budding friendships, energy, and questions! Preschoolers can now run, jump, climb, and pedal a bike. They no longer “toddle”! Tumbling and outdoor playgrounds are favorites. Fine motor control is becoming more defined. They are starting to cut with scissors, hold pencils like an adult, and string beads. Blocks, Legos and other construction materials are a favorite along with anything to role play like dress up clothes and dolls. The preschooler’s mind is like a sponge. Have you ever spent the afternoon with a curious preschooler? Learn to answer the question “Why?” I know I bought a book about how things work to try to keep up with my son when he was 5! A preschool aged child looks at the world with imaginative eyes, and has very magical thinking. Sometimes they tell “stories” and it is difficult for them to tell the difference between what is “real” and what is “pretend”. Be prepared for some “tall” tales. Board games are fun at this age, but at 4 and 5 children can have a very difficult time if they don’t win. They are not very good sports! It is important to play games and talk about the feeling of losing and winning. A preschooler’s vocabulary will be quite large, and often they will sound much more adult than their emotions are. They are verbal and bossy! Such a fun age. Children at this age will embrace the world around them and want to do it all. Have fun doing all the “kid” activities in your community and watching your child start to form real friendships. Here are a few milestones you should be seeing in your 4 to 5-year-old child as they prepare to enter kindergarten in the near future! Will be curious about their body, will ask about body parts…give the correct names! Will be curious about “where babies come from” give small amounts of information at a time until they are satisfied. Will be aware that girls and boys look different, may play “doctor”…teach children what is private, that no one touches in the bathing suit zone, and keep conversations open so children feel comfortable asking questions, remember children may ask sexual questions, but they do NOT have sexual feelings at this age! Relax! Read, read, read to your child! Take them to the library and help them develop a love for books and reading. Give your child simple chores in the house. Give praise for their help! Provide social interaction for your child. This helps them learn the value of friends, cooperative play, empathy, and sharing. Be very consistent with discipline. Give expectations of the behavior you expect prior to going anywhere. Follow up with consequences when your child does not follow the expectations. Do not melt down yourself, no emotion, loving discipline. Time out still works! Speak to your child in complete sentences using adult words. This will help your child develop good grammar and use correct words and phrases. Help your child problem solve step by step. Give your child choices each day…clothing, some snacks, books to read etc. This gives a feeling of control and increases cooperation. Explore your community with your child; the zoo, museums, parks, nature centers, playgrounds…..build your child’s interests! They are ready! This campaign educates parents about childhood development, including early warning signs of autism and other developmental disorders, and it encourages developmental screening and intervention. It will give you tips on how to determine if your child needs screening. Learn more about early intervention services from the National Dissemination Center for Children with Disabilities. Find out about your state’s early intervention program and how to access it. Bright Futures materials for families are available for parenting tips for children from birth to 21 years of age. This is provided by the American Academy of Pediatrics. This American Academy of Pediatrics website provides guidelines on surveillance and screening for developmental delays in children. NAEYC provides accreditation for early childhood programs and preschools that meet certain standards. You can search for an accredited program or preschool near you. NAEYC also provides resources, tools, and information for parents. Every day is an adventure with your preschooler. So, begin to prepare for the endless questions, pull out the board games, (my least favorite is Candyland, my suggestion is stack the card deck so it doesn’t last forever! ), find some dress up clothes and play house, plan some play dates and sit back and watch your child grow! Before you know it, your preschooler will be heading to kindergarten!